The moment you know you've really made it as a Dark Souls or Bloodborne player is when you learn to parry on command. Being able to parry reliably allows you to defeat potential enemies quickly, avoiding protracted duels in the process. Sekiro: Shadows Die Twice, a successor in spirit if not in practice, takes this element further than ever. Playing as a shifty samurai—a 16th century Solid Snake—you will rarely find success in direct combat. Instead, you need to rely on stealth, your trusty grappling hook, and effective parrying to survive. While there will reportedly be a handful of RPG elements, including multiple katana styles and tools, you won't be able to min-max your way to victory in Sekiro. If you can't get your timing down, you're going to have a bad time. Director Hidetaka Miyazaki told USG during E3, "In terms of combat, the idea is not to gradually chip down your opponent's health. It's a battle of postures. And so the idea is to wear down their posture, throw them off balance, and look for that one single opening—that one single chink in the armor—and lay in the finishing blow. So that's the general approach of this combat system." 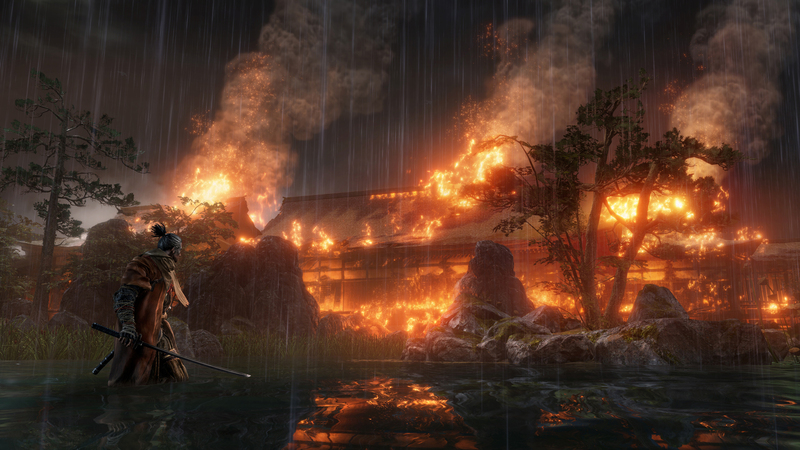 In that respect, Sekiro is as hard as any other From Software game—perhaps even harder. I was never that good at parrying in the Soulsborne games, and I wasn't any better in Sekiro. But it's truly essential here. Even basic soldiers can stop your attacks, forcing you to learn to parry lest you roll around haphazardly looking for an opening (not an optimal approach). 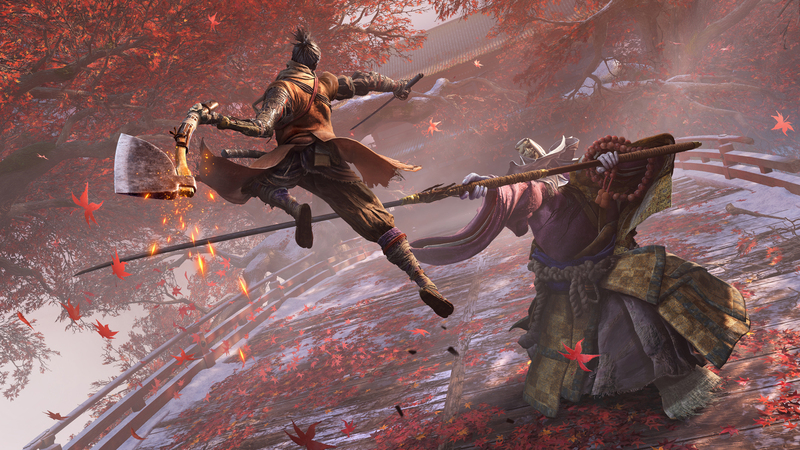 You can get away with that for a while, but sooner or later you will have to come to grips with Sekiro's combat. For me, that moment came during Sekiro's featured boss battle. After working my way through a medieval Japanese castle, then skirting a snake the size of a freight train (it was very cool), I found myself face-to-face with an undead monk. It's a test of your preparedness, and I definitely was not prepared (nor was anyone else, to be fair, since apparently no one was able to beat the boss). The fight takes place amid a narrow grove of cherry blossom trees—a spectacular splash of color that serves to break up the grim and snowy castle that comes before it. The monk descends with no fanfare, lashing out with a long polearm that is difficult to avoid simply by rolling. You have to time out their attacks and evade them by leaping into the trees, or failing that, performing an expert parry. The monk has three full energy bars, making it a grueling fight that demands complete concentration. It is in many ways reminiscent of Bloodborne's famous Father Gascoigne fight, even down to the three distinct phases marked by the energy bar. And like the Gascoigne fight, it is a true test of whether you understand the systems at hand. Alas, I was only able to knock off one of the health bars, which I accomplished with some deft aerial maneuvering—leaping over the monk will lightly stun them with a move akin to Chun-Li's heel kick—and a couple lucky parries. Then they went into their second phase, and well, that was pretty much that. I'm going to need a lot more practice if I'm going to have even a chance of making it through Sekiro. Something tells me it'll be worth it, though. For all my kvetching about Sekiro's difficulty, it's a stunning action game—one that takes the best bits of Bloodborne and incorporates them into its own distinct identity. I found myself drawn in by the tactical give and take of the combat, which culminates in a satisfying spray of arterial blood like that of Kill Bill. I've hardly touched on the grappling hook, which affords you the sort of mobility rarely seen in a From Software game, or the fact that you can set your sword ablaze with a gout of fire from your cybernetic arm. Indeed, From Software's fingerprints are all over this game. True to form, it features a unique resurrection system (this is where the Shadows Die Twice, I suppose) that lets you pick up a fight from where you left off. It includes a handful of tools, among them shurikens and a heavy loaded axe useful for cleaving shields, and a life restoration potion similar to the familiar Estus Flask. It even has a little shrine reminiscent of Dark Souls' familiar bonfire where you can save your progress. One thing it does not have is multiplayer, which is honestly kind of terrifying. I've long relied on the kindness of Sunbros to get me through the tougher sections in Dark Souls. In Sekiro, I'm going to be operating without a net. I won't even have overpowered weapons like the Dark Sword to get me through. From Software's reputation for difficulty has become somewhat overblown over the years, but in this instance, I really think its justified. If what I played is any indication of the final product, Sekiro is a highly technical action game that absolutely demands mastery. The git gud crowd is gonna love it. Sekiro: Shadows Die Twice is slated for release on PlayStation 4, Xbox One, and PC on March 22. Here's everything we know about Sekiro so far. Tagged with Action,	Activision,	Analyses,	FromSoftware,	PC,	PlayStation 4,	Xbox One.